Highlighting the plight of the endangered marsupial Tasmanian Devil and remembering the aboriginal heroine Waubadebar. Profits go to local Bicheno Nippers club. Located on Tasmania's East coast, 195 kilometres north-east of Hobart, Bicheno was established as a whaling centre as early as 1803. It was at this time that the sealers and whalers arrived and began using Waubs Boat Harbour (one old name for Bicheno, another was Old Fisheries) as a base for their activities on the east coast. The sealers and whalers actually pre-dated the first official settlement of Van Diemens Land. They lived a primitive and dangerous life and were known to be particularly cruel to the local Aborigines who they enslaved and prostituted. The name “Waubs” is an abbreviation of “Waubadebar” a female aborigine with an heroic and tragic life. She was probably from a band of the Oyster Bay (Paredarerme) tribe living nearby. 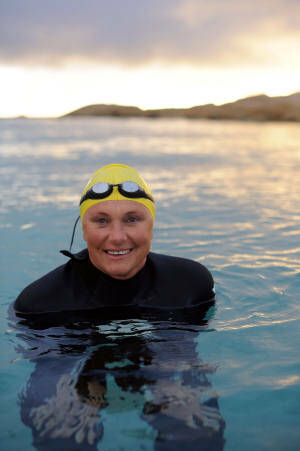 A strong swimmer, she saved two white men from drowning by swimming them to shore one by one, when their boat was smashed against the rocks during a storm. It was rare for any honour such as a place name to be bestowed on an aborigine.Her grave is located at the back of the Lions Park, near the Silver Sands Hotel. The headstone reads “Here lies - Waubadebar a female aborigine of Van Diemen’s land, died June 1832, aged 40 years.” She died in a boat off the coast whilst travelling towards the Furneaux Group of islands and her body was brought ashore and buried. John Allen, an early settler, in his notebook, dated 24th June 1840, mentions “Waubs Harbour”. Sufficient was thought of her memory for the local settlers in 1855 to contribute funds to erect a headstone. The Devil of a Swim is in honour and memory of Waubedebar, as I presume her rescue effort was 'a devil of a swim'.